Claire: We've been in Cambodia for nearly a fortnight now and already we've learnt so much about the horrific Khmer Rouge period and the devastating effect it had on the nation. 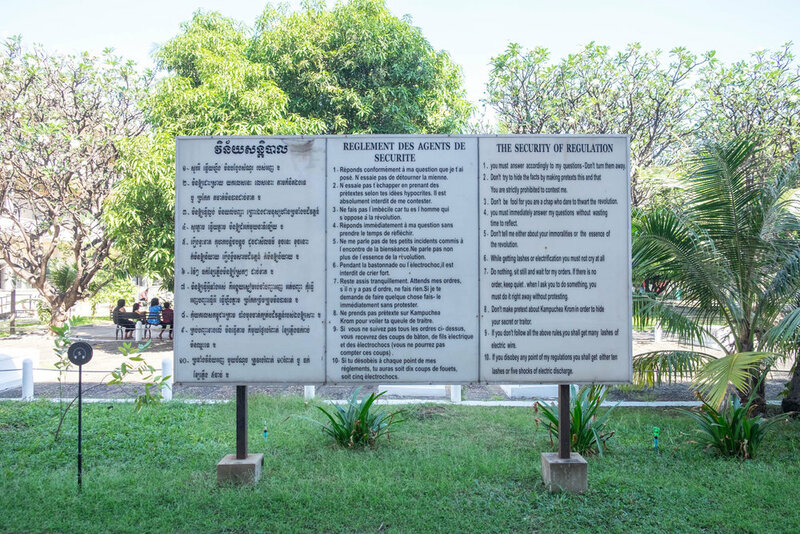 We feel so naive that until booking our trip we were totally oblivious to this brutal regime — one of history's largest genocides that killed a quarter of Cambodia's population. 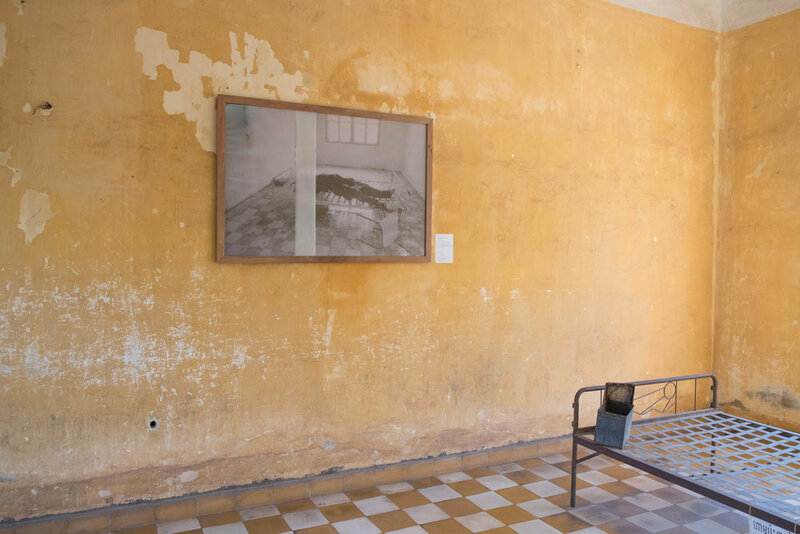 Visiting the Tuol Sleng Genocide Museum was a harrowing insight into what happened at S21, the former high school that was turned into a torture prison by the Khmer Rouge. We purchased the audio guides which gave an immersive experience, both sickening and saddening. Our in-ear tour eerily explained what happened in the prison where nearly 14,000 people entered, but only 7 survived. In 1975 the Khmer Rouge forced the whole population of Phnom Penh into the countryside in an attempt to create an agrarian utopia. Many died of starvation and disease by overworking in the blistering heat. Anybody thought to be of intellect or educated was killed, or bought to the prison to interrogated, tortured, then executed. Even wearing a wrist watch or glasses was an offence! Eventually all cities were abandoned across Cambodia. Throughout the tour I found some of the things really difficult to see. The in-ear narrative was really interesting but eerily it made it feel so real too. 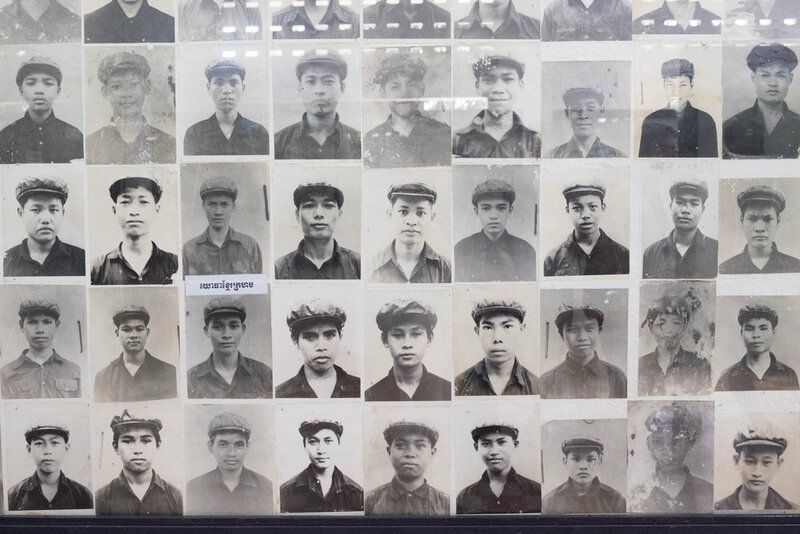 Khmer Rouge took photos of every person who entered the prison, and seeing how young some of the faces were was heartbreaking... there was even mothers with babies in their arms. As we finished the tour we sat under a tree in the courtyard. I don't think we spoke to each other for about 20mins (rare for me, I know!) as we reflected on what we'd seen and the stories we'd heard. There's a wonderful outreach charity doing fantastic work by bringing families from all across Cambodia to the museum. Many have never left their villages, let alone come to Phnom Penh or even understand the wider picture of what Khmer Rouge did to their country. This means that now, even 40 years later, people are only just piecing together their stories as they recognise family member photos on the walls of S21. The memorial in the courtyard has plaques listing all the victims which have been identified so far. Obviously not entirely pleasant experience but life isn't just one big holiday is it??? Jokes aside, I thought this museum and audio tour in particular was excellent. I thoroughly recommend it to anyone.